You could order to write the name or short text after purchase. 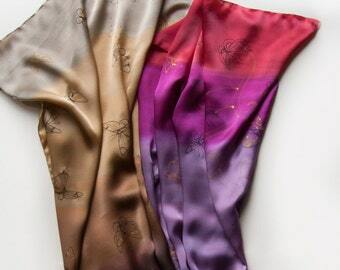 Hand painted silk satin scarf shawl -The Orchids Tango. Wedding accessory. 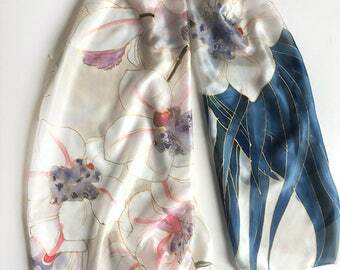 Orchids Satin Shawl painted by hand. 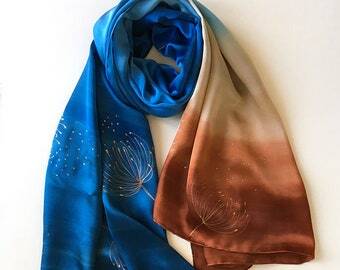 Anniversary gift for her.Hand painted silk scarf shawl in purple and light blue. 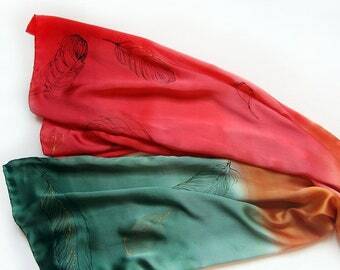 Luxurious scarves painted. Purple blue satin shawl. 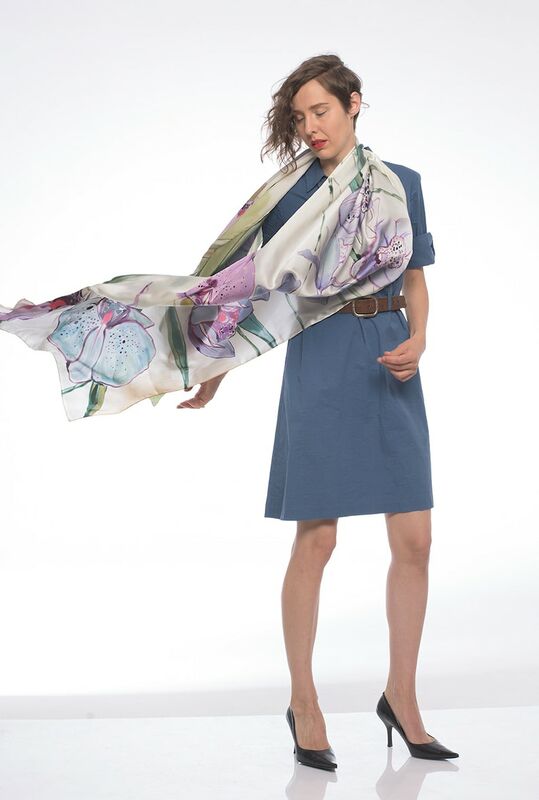 Orchids scarf. Long floral shawl with blossomed orchids on white background. Bridal accessory. 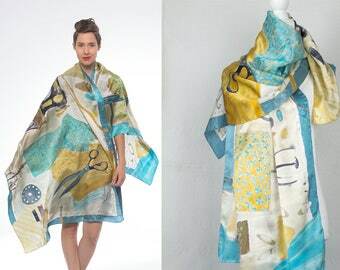 ►This is a unique, hand painted silk scarf measuring 35 by 70 inches. Each and every purchased scarf is carefully gift wrapped. Please, Note! 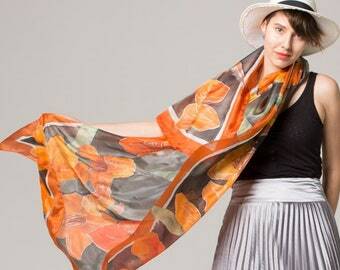 The scarf from this great photo was sold. This is one of my favourite photos in my shop and it's a popular. i will make a replica on it soon, after you order me. ♣I never use stencils or guides.All my scarves are one of a kind. each time they are entirely unique and nothing is ever printed or copied. Some slight imperfections make the scarf even more distinct. All my scarves are carefully hemmed by hand, making my scarves completely unique and entirely hand made. This I think is an absolutely essential quality to hand painted scarves! All my scarves are on of a kind. Please note: Colors will vary slightly due to calibration differences in monitors!!! All scarves will be washed and ironed before shipping. Silk Shawl Purple Ombre. 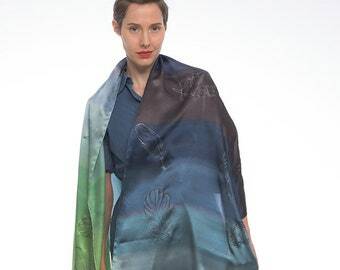 Hand painted silk satin scarf. Electric pink, slate scarf/ Geometric scarf. Bright colored shawl. Luxurious scarf. Amazing work. You are so talented. The scarves are gorgeous! Scarf can be hand washed in cold water with a mild soapy or shampoo. Rinse in clear, cool water until all the soap is gone. Be careful not to rub or twist the scarf too hard as well as not to let it soak for a long in the water. Only to be gently hand washed in no warmer than 90 F water, using a wool/silk detergent. Do not wring out. Roll up in a towel to remove excess water, then reshape where needed, leave flat to dry. Ironing on the back side of the scarf. I never use stencils or guides. All my scarves are one of a kind. motives more than once, each time they are entirely unique and nothing is ever printed or copied. and each kind requires a slightly different approach. Some of them permit a more detailed drawing, and some suite a more abstract stroke, and others yearn for luxurious motifs. ♥ I use only high quality silk fabrics and no use any synthetics for my work. Wholesales are available for more of 15 products.